Double running stitch is a basic embroidery stitch that is both decorative and functional. 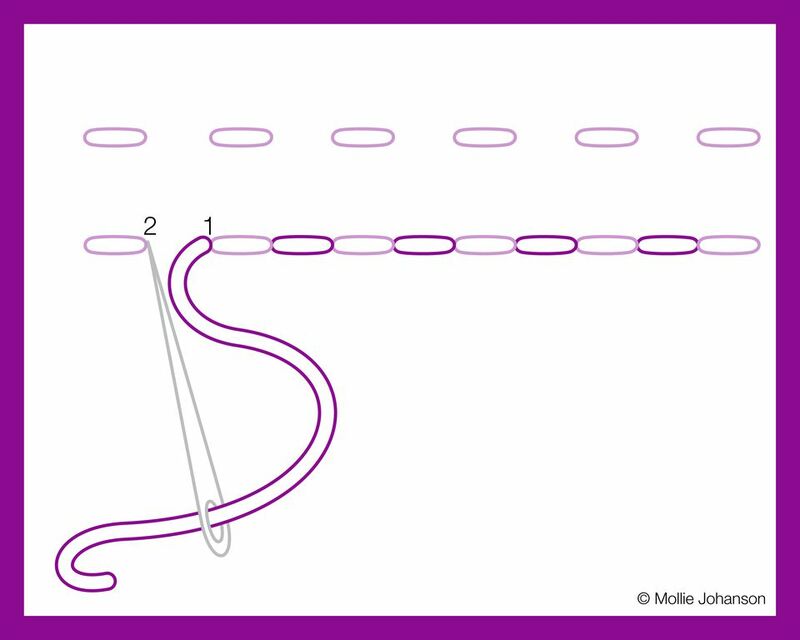 Sometimes called Holbein stitch, this stitch is worked in two passes using standard, single running stitch. The result resembles back stitch, but it is the same on the front and back. Work double running stitch on both straight and curved lines. Work the first pass as you would work a row of standard running stitch, spacing the stitches evenly, with the gaps between stitches having the same spacing as the stitches. The first pass is shown in lavender in the diagram. The second pass is made by working running stitches through the gaps made in the first pass. This is shown in purple in the diagram. As you make the second pass, you'll find that your needle is passing through the first row of stitches as it goes through the holes. Take care that you don't split the threads in such a way that shows a lot. You might even try to bring the needle through next to the threads, though this can be tricky, and might make your line look a little wobbly. Because double running stitch looks very much like back stitch when you first look at it, you might wonder why you would choose to work it in two passes rather than one. One reason is quite obvious when you look at the sample above. Using double running stitch allows you to work a line in two colors of thread. Think of the possibilities! Another way to do this is with two weights of thread. For example, stitch the first pass with 2 strands and the second pass with six strands. The difference in weight will show and give your work a noticeable texture. Working with double running stitch also gives the back of your work a very nice finish. If you want the look of back stitch on a piece where the back will be seen, this is a good alternative. Finally, a double running stitch is useful for sewing seams on hand sewing projects. Again, the work is tidy, but it's also strong because it has two sets of threads running through it. As with single running stitch, there are ways to dress up and add variety to double running stitch. For example, wrapping and weaving the stitches is an easy way to bring even more color and design to this simple stitch.